The last female caribou deer living in the north of the United States near the border with Canada was caught by environmentalists and transported to a nursery in an attempt to save these animals from extinction. On the future plans of scientists tells the news service of the journal Science. “Deforestation in the mountains of the United States and Canada help other ungulates, elks and deer to spread, which attracts wolves and mountain cougars. Predators penetrate neighboring reserves and destroy the last caribou. – tells Aaron Reid (Aaron Reid), an ecologist from the Forestry Department of British Columbia in Penticton (Canada). Until recently, reindeer were among the most common animals in the Russian, Canadian and American regions of the Arctic and in the adjacent areas of temperate latitudes. The number of many herds reached several hundred thousand animals, and their condition, despite global warming and the processes associated with it, gradually improved until recently. Recently, these trends have radically changed, and now many forest caribou subspecies living in the taiga mountain forests in southern Canada and the northern United States are on the verge of extinction. Their numbers fell from nearly one hundred thousand individuals at the end of the last century to several thousand today, which scientists associate with massive deforestation, oil extraction and penetration of southern deer into their habitats. The “gray ghosts” – forest caribou living in the northern regions of the United States, in the territory of Idaho and Washington – suffered the most. Their number, as the scientists noted last year, was reduced to only three individuals. Repeated proposals of scientists to bring a few dozen Canadian deer did not find support from the authorities of the country. 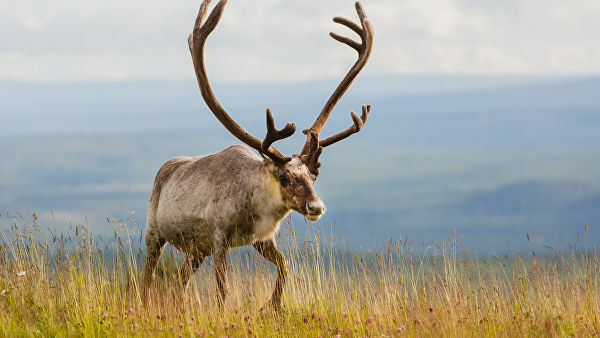 Similar problems led environmentalists from neighboring regions of Canada to develop a different tactic, which they hope will help them to save forest reindeer in both countries. For the last two years, they have led a kind of “hunt” for these mountain dwellers, lulling and transporting single individuals, whose groups have ceased to exist, to a special nursery in the vicinity of the town of Revelstoke in southern British Columbia. Tapetum is responsible for the color of the eyes of the reindeer – a special layer behind the retina that reflects light. Many animals have this layer, for example, because of it cats’ eyes “glow” with green. Recently, according to Science, they caught all three American “gray ghosts”, actually clearing the territory of the United States from these animals. In the near future, they plan to merge them with a larger group of caribou caught in Canada and release them in one of the reserves on the border between the countries. Many environmentalists, including Reed, doubt the feasibility and feasibility of such initiatives. Canadian caribou and their new comrades are likely to suffer the same fate as their American relatives, if the onset of southern deer and deforestation does not stop. Moreover, in his opinion, the similar fate of animals is beneficial for the authorities of the region, as it allows to remove the status of protected areas from the forests where they used to live, and to donate them for cutting or oil production. Similar problems, as the scientist concludes, in the near future will affect other animals living in mixed and coniferous mountain forests.